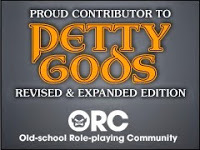 A fellow HackMaster player and new blogger Andrew Bush gave me a head's up last week about some free RPG themed music that is up for grabs until February 9th. 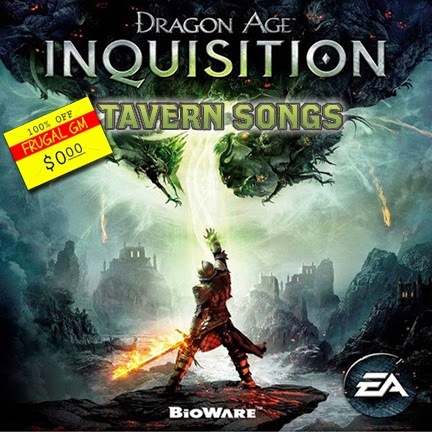 Evidently the folks at BioWare had been inundated with requests for the tavern music from the Dragon Age: Inquisition game and they decided to comply. From now until February 9th you can head over to the game's website and download a zip file of 10 tavern songs. If that isn't enough for you, they've also included sheet music for the songs as well! No I can't carry a tune with a bucket, but I'm willing to bet a few brave souls will take this sheet music and run with it. It wouldn't surprise me to hear some cool versions of these songs floating about eventually. Now I'm personally not a fan of filking, but that's just me......don't let my opinion keep anyone from getting their geek on. The songs are short, ranging from 1:11 to 2:13, although one song is a whopping 3:23. I'm planning on using these to spice up my in-game sound board (when I get off my but and organize it!). If you come across this after February 9th, 2015 all isn't lost as the songs will be made available for sale. It isn't as good as free, but then that is what you get for not following the Dragon Age, FrugalGM, or Dungeon Beef websites.